It's time for another questing update! When I left off before, my crew and I were going to track down Admiral Nelson who had gone to intercept the Armada in the skyways. Well, when we got there, it was a mess! Admiral Nelson and his crew had been pretty much blown out of the...um...sky. And they had been captured! But never fear! Super Autumn Walker and crew were there to save the day! This is the dungeon where we finally get to face off with Rooke.....twice! But before we even got to that part, there were several other battles, one of involved saving Admiral Nelson's crew. This battle was kind of cool, because first you have to free the crew by blowing up some debris. Then they actually join in the fighting and help defeat the Armada guys for that battle. I thought it added a nice twist to the dungeon. All the rest of the battles were pretty straight-forward though. 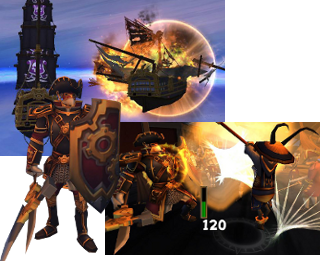 Once we get through the ship and all these smaller battles, we finally get to face Rooke! The objective in this battle is to defeat Rooke and to protect Admiral Nelson. And not only is Admiral Nelson helping out, but so are several of his comrades. Anyway, this battle was a more straight forward, defeat all enemies type of battle. And it went well. Rooke was defeated again and my crew blew up everything. After all that, I delivered Admiral Nelson back to the War Room and finally got my commission! 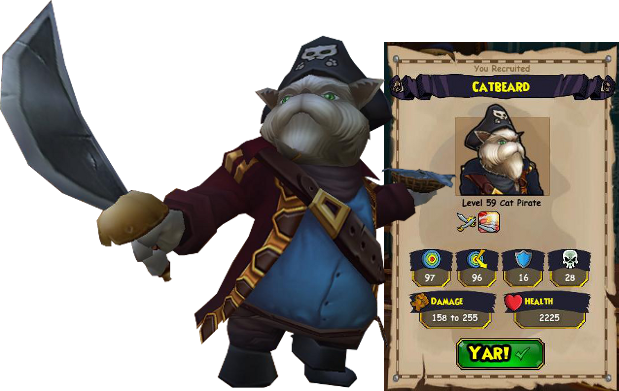 That meant I could save Catbeard! So it was off to the courthouse. And after lots of talking....I had a new crew member! Here he is!